High Sierra Theatres Picture Perks Reward Club membership may be obtained at any participating High Sierra Theatre or to signup online CLICK HERE. High Sierra Theatres Picture Perks Reward Club is open to all customers 13 years or age and older, except High Sierra Theatres employees and their immediate family members. Any other exclusion will be based on the judgment of High Sierra Theatres. 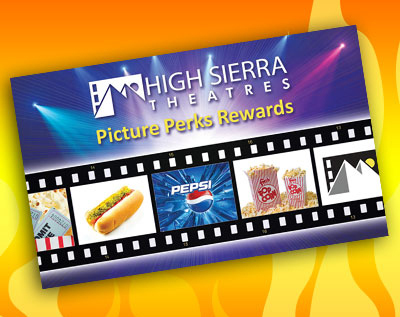 High Sierra Theatres Picture Perk Club members will receive 1 credit per dollar spent on ticket or concession purchases at any High Sierra Theatre with a maximum of 20 credits per card, per day. Credits are NOT earned for admissions obtained by redeeming complimentary passes, emergency tickets. Members do NOT receive credits for Value Pass purchases; however they DO receive credits when redeeming Value Passes at the box office for admissions. Credits are NOT earned when purchasing Gift Cards but do receive credits for gift card redemption. For the purpose of calculating credits earned at the box office, the system will round transaction totals to the nearest whole dollar. Example: Transaction Total = $8.75. Credit earned = 8; Transaction Total = $6.25, Credits earned = 6. To earn credits, a High Sierra Theatre Perks Card MUST be presented to the cashier when purchasing tickets or concession items. Members receive rewards each time 30 credits are earned. See Reward Schedule for details. Reward vouchers only print at a participating theatre’s box office. “FREE Movie Ticket” reward vouchers are not valid for “NO Pass Attractions and special events.” FREE Movie vouchers are not valid until the expiration date indicated. All concession item reward vouchers are small size unless otherwise indicated. Reward vouchers are void if illegible, altered, torn, or mutilated. Vouchers must remain whole. All rewards are subject to verification by management. High Sierra Theatres reserves the right to change, alter or discontinue the program and/or rewards structure at any time without any liability to members. High Sierra Theatres Club Cards are nontransferable. High Sierra Theatres will not share any Picture Perk Club Members information with anyone. For more information on our policy, please visit our website at HERE. As a member of the Picture Perks Reward Club, you will earn one credit for every dollar spent on movie admissions or concession purchases at any High Sierra Theatre. There is a maximum of 20 credits earned per card, per day. See Program Rules for details.